1. Moisten a clean sponge and wipe MB1499 bisque to remove dust. 2. 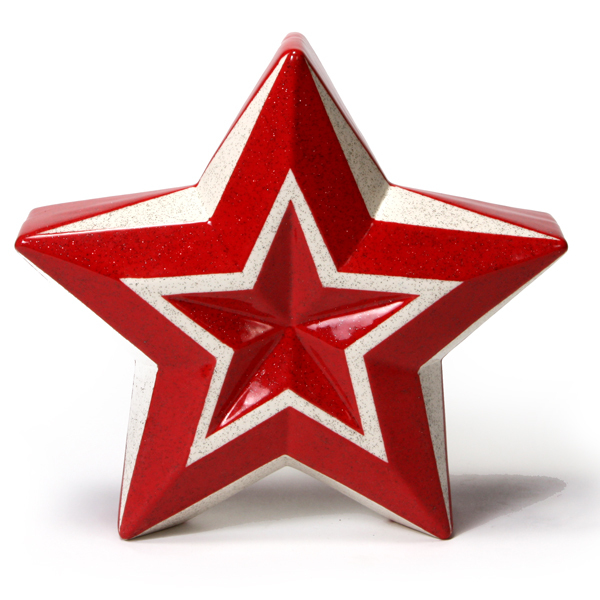 Put the Faceted Star flat on the table, so that the small inner star is facing up. 3. Using MC-001 6mm Low Track Masking Tape, tape off the inner star. Use an X-ACTO knife to trim off any excess. You don't want any tape on the inner star. 4. Using a Soft Fan brush and SC-87 Ruby Slippers, apply three coats to the inner star. Allow glaze to dry between coats. Before the last coat of glaze is completely dry, carefully remove the tape. 5. Leave the adjacent star facet as bisque. 6. Using MC-001 6mm Low Track Masking Tape, tape off the next star facet. Use an X-ACTO knife to trim off any excess tape. 7. Using the Soft Fan and SC-87 Ruby Slippers, apply three coats to the star. Allow glaze to dry between coats. Before the last coat of glaze is completely dry, carefully remove the tape. 8. Repeat steps 5-7 until the entire star is complete. 9. Make sure star is completely dry. 10. Using the Soft Fan and SG-701 Star Dust, apply two coats to the entire star.